There remains a HIGH avalanche danger in the Alpine (above 2,500'). Natural wind slab avalanches 2-4' thick will be likely due to strong winds forecast today in the mountains surrounding the Eastern Turnagain Arm (such as Turnagain Pass, Girdwood Valley and Placer Valley). Below 2,500' and in areas out of the wind, a CONSIDERABLE avalanche danger exists for storm slabs 1-2' thick composed of new snow from Tuesday night's storm. Natural cornice falls are also possible and could trigger slabs below along with loose snow avalanches. With the continued active weather pattern, today will be another day to avoid avalanche terrain. *A potent storm system moving in tonight is expected to keep the danger elevated into the weekend. Summit Lake: Roughly 6-8" of new snow fell as of yesterday. Strong winds are expected in this region as well. Read the Saturday Summit Summary HERE. Tomorrow is the deadline for applying for your 2017 PFD!! Please consider showing your support for public avalanche centers when applying - the Friends of the Chugach National Forest Avalanche Center is an official Pick. Click. Give. organization! *A reminder that the Skookum Valley closes to motorized use on April 1st, this Saturday. All other motorized areas remain open - see area status on the bottom of this page for more information. After a brief break between storms, another system is literally on the doorstep. This one is characteristic of a Classic Chugach Storm - warm, wet and windy. Opposed to Tuesday night's storm which was cool and calm; meaning 1-2+ feet of new snow fell with relatively light winds. Avalanche activity yesterday consisted of many natural and remotely triggered storm slab avalanches in the Girdwood Valley and Placer Valley where over 2 feet of snow fell. Observers noted significant propagation with these slabs which points to the fact the new snow is sitting on weak old snow. In general, visibility was very hampered and at Turnagain Pass where only a foot of new snow fell, only one natural avalanche was seen on Tincan's Southerly face under Hippie Bowl. Strong winds today should have an easy time moving yesterday's new snow around and loading leeward slopes, creating large wind slabs and cornices. These are likely to release naturally and could entrain enough snow to run quite far. In areas such as Portage Valley where over 2' of new snow has already fallen, these slabs could run to sea level. In areas out of the wind, expect the recent storm snow to still be touchy. Where up to 2 feet of new snow has already fallen, such as Girdwood Valley and Placer Valley, human triggered slab avalanches 1-2' thick are still likely, as was the case yesterday. At Turnagain Pass, with only a foot of new, shallow slabs and sluffs are possible. Sluffs in the new snow should be expected on all aspects and elevations - this issue is overshadowed however by the much more concerning avalanche problems mentioned above. All this said, with the active weather over the region, travel is avalanche terrain is not recommended. Sticking to the flats, well away from runout zones, heading to the local ski hill or filing your PFD/doing taxes are all good options for the next few days! Five Sisters slide path in the Portage Valley. Skies opened just enough to see several crowns 2-3' thick in the recent storm snow; hard to see in the photo. Fresh debris did not run to the valley floor, only part way down over the older debris. 14" of new snow sits over facets on North aspects (photo below) and a sun crust (.5 - 1" thick) on Southerly asepcts at Turnagain Pass on Tincan. 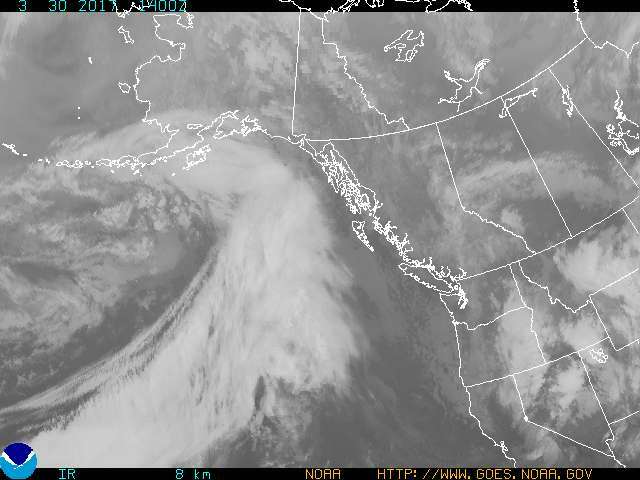 Satellite image from 6:00 am (infrared image) of the large low-pressure headed our way today and forecast to churn warm, wet and windy weather in the region through the weekend. Don't forget that our snowpack harbors several old layers of weak snow. Avalanches releasing in the storm snow have the potential to 'step down' into these layers. Furthermore, as the new snow piles up and begins to stick to the old snow surface, avalanches breaking into them is possible as well. Both of these situations can create a much larger avalanche - something to look for in the coming days. Intense snowfall from Tuesday night's storm tapered off significantly by noon yesterday. Storm total was 12-14" of new moist snow on Turnagain Pass and 24-34" in the Girdwood Valley and Placer Valley. Skies were mostly cloudy and temperatures were warm - upper 30'sF at sea level and the mid 20'sF along the ridgelines. Ridgetop winds during the past 24-hours have been light (5-10mph) from the East - but have just bumped to moderate (15mph) as of 5am this morning. Today, ridgetop winds will continue to increase with averages up into the 25-40mph range from an Easterly direction with gusts into the 50's+ mph. This is in advance of a large low-pressure system moving in bringing warm, wet and windy weather. Precipitation should begin later this morning with 2-6" of snow to sea level accumulating by 6pm and another 6-12" by 6am tomorrow. Temperatures should climb today into the low 30's F at sea level and stay in the mid 20'sF along the ridgelines. Tomorrow, Friday, warm air is expected to push in bringing the rain/snow line to between 500 and 1,000'. Another foot(ish) of snow is expected on Friday above 1,000'. Stay tuned as this Chugach Storm develops!